A special turntable helps machines at Legacy Manufacturinig remove hose from a crate without it getting twisted. Josh Shepherd, Legacy’s assistant operations manager, said the company turned to CIRAS as part of an effort to bring production of its 3/8-inch, 50-foot Flexzilla hoses back to the United States from Taiwan. “Some of the reasons have to do with cost, but a lot of it is just flexibility,” Shepherd said, noting that problems such as port congestion and long production lead times required keeping more inventory on hand. The company was anxious to reduce that investment while the same time adding Iowa jobs. By the time Legacy turned to Chris Hill, director of the CIRAS Technology Assistance Program (TAP), the company already had found an American supplier for its raw hose material. But a key problem remained: The new supplier was shipping hose to Marion in 5,000-foot sections. 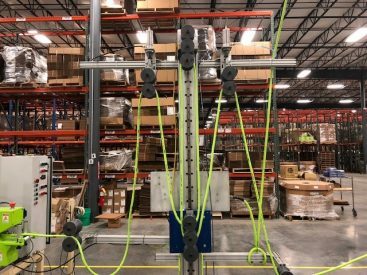 How was the company going to quickly and cost-efficiently get the hoses straightened, cut, assembled, and packaged? This machine helps keep hose flowing to the cutter at an even pace. CIRAS worked with Iowa-based Berg Automation and ultimately devised a special turntable (to unwind each hose after it’s been shipped coiled in a box), as well as coordinating sensors to monitor the hose’s progress as it heads toward a cutter. New employees then handle the cut hose as it’s affixed with connectors and packaged. 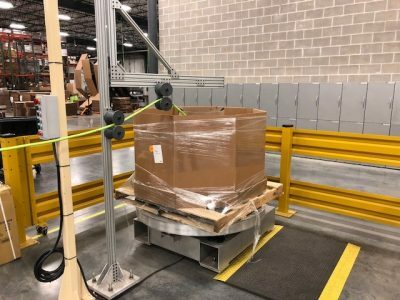 Shepherd credited CIRAS and Berg with helping Legacy clear the first major hurdle in figuring out how to automate the process – getting the hose out of its box and untwisted in a way that worked with Legacy’s existing machinery. For more information about automation, contact Chris Hill at chhill@iastate.edu or 515-313-8251.